F615P, Flemish, and Arctic mutations abolished BACE2 cleavage of nascent APP. (A) APPWT and APP with the KKXX ER retention signal (APPER) were coexpressed with BACE1 or BACE2 in HEK293 cells. CTFs and APP were blotted with C20 and BACE1 and BACE2 were probed with anti-Myc antibody. mBACE1 and imBACE1, mature and immature BACE1, respectively. (B) APPER with a FLAG tag inserted into APP after the signal peptide was coexpressed with BACE1 or BACE2 in HEK293 cells. Cell lysates were blotted for APP, CTF, and BACEs. Secreted APP (sAPP) in the conditioned media was enriched by immunoprecipitation using FLAG-agarose, and Western blotted using anti-FLAG antibody. (C) APPER was coexpressed with BACE1 or BACE2 in HEK293 cells, and treated with the translation inhibitor cycloheximide (CHX, 100 μM) for the indicated times. Full-length APPER, CTFs, and BACE2 were blotted. 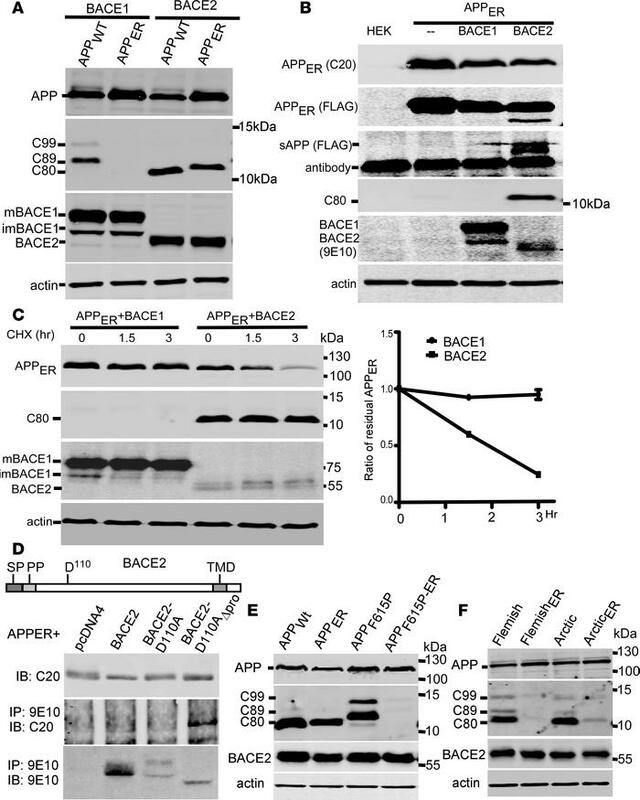 Immature BACE1 decreased due to ceased protein synthesis and continuous BACE1 maturation. Residual full-length APPER relative to time 0 was plotted. Curves represent mean ± SEM. (D) Schematic diagram indicates domains and the first active site in BACE2. SP, signal peptide; PP, propeptide; D110, the first active site; TMD, transmembrane domain. APPERwas coexpressed with Myc-tagged BACE2, inactive BACE2 mutant (BACE2D110A), or BACE2D110A without the propeptide (BACE2D110A-Δpro). BACE2 variants were immunoprecipitated (IP) with anti-Myc 9E10 antibody, and the precipitates were immunoblotted (IB) using the indicated antibodies. APPF615P (E) and APP Flemish and Arctic mutants (F) with the ER retention signal (APPF615P-ER, FlemishER, and ArcticER, respectively) were coexpressed with BACE2 in HEK293 cells. CTFs, APP, and BACE2 in lysates were blotted.